How we lost 1.3 million households from 2008 to 2009. Preliminary Census data is now coming out showing the effects of the recession on a macro scale. The 2008 Census figures don’t highlight the deep capital loss that was experienced by middle class families over the last two years. We now have data showing how deep the recession has gotten. From 2008 to 2009 the U.S. actually lost 1.3 million households. Most would probably assume that this loss came from the vast amount of foreclosures in the market. Although this is true and probably would reflect a slower growth rate for owner occupied households, the big drop came from those that rent in the country. There are a variety of reasons for this to happen but first let us look at the new data figures. -1. Subsidies for home buying. 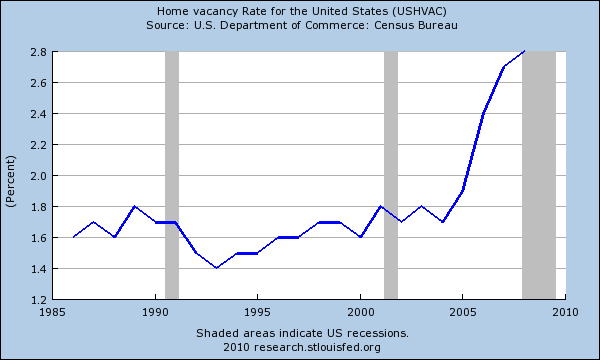 This has pulled demand for purchasing homes even though the economy is weak. -2. Renters don’t have the protection that home buyers do. In many states renters can be evicted within one month. We have now heard of cases of people living 12 to 24 months in a home without making a payment as long as they have a mortgage. So the real market pain is reflected with renters on a real time basis while homeowners have added cushions from banks and government subsidies. -3. Renters are usually less financially able to weather an economic storm. Of course this was much more the case before the housing bubble. However, many households have consolidated because of the recession. With a month to month lease, an economic change for a family can result in a quick move to find roommates. A homeowner can’t react as quickly. 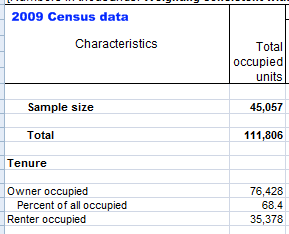 The amount of owner occupied housing actually increased by 1 million. For the above reasons (i.e., Federal Reserve keeping mortgage rates artificially low, tax breaks, etc) this has pushed people to buy homes in an otherwise slower market. But keep in mind that empty homes are still part of the real estate pool. If you merely yank one household and pull them into another without filling the pipeline, the problems will still remain. 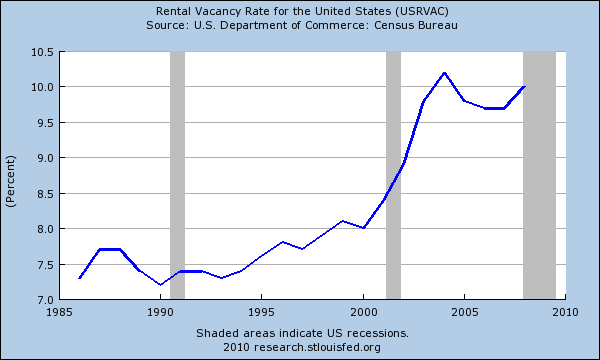 That is why we are seeing massive jumps in vacancy rates for commercial real estate property. A loss of income is a loss of income no matter how you slice it. The real concern should be on the aggregate amount of households being created and from 2008 to 2009 we lost 1.3 million households. To put this in perspective, we added 724,000 households from 2007 to 2008. 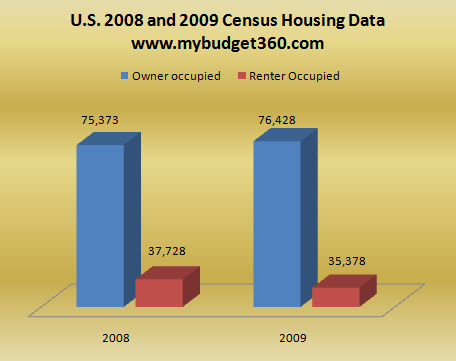 From 2006 to 2007 we added 760,000 households. Hard to see a recovery happening when working and middle class families are actually decreasing the amount of households while a glut of real estate is out in the market.